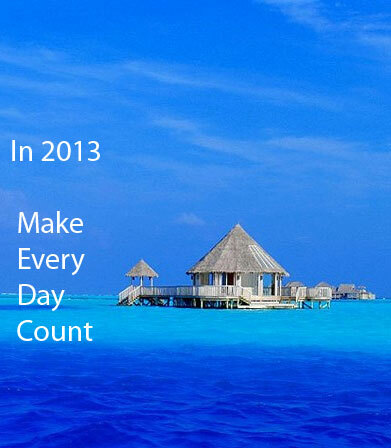 Make Every Day Count in 2013 | Digital Marketing, Poetry, Reviews, Philosophy, Sports & Tales by Joe Wooldridge. I am going to endeavor to Make Every Day Count – day by day in 2013 – and track it. 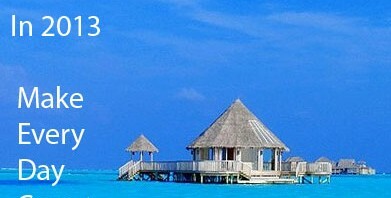 I want 2013 to be my best year so far in my life on a number of levels. This is not my list of goals for 2013, this is my approach to attaining those goals (in addition to a written plan). I figure if I can make a concerted effort to keep track of my daily efforts to make every day count – then I have a chance to really realize some dreams. What would make the day count? 1. Monday-Friday will be my primary work week. 3. Sunday will be for God/rest/fun. 4. I will keep a record of what I did each day to make the day count (some will be better than others). 5. If I am sick that day, I will consider resting, recovering and taking care of my health to be the optimum way to make the day count. 6. I may spend time working on Saturday/Sunday as needed for projects. 7. I may spend time M-F for R&R to counteract #6. 8. Fitness (stretching/weightlifting/running) will be a regular point to Make Every Day Count. a. If I feel better every day then every day will be much more productive. 9. Spending time with family, loved ones and friends will be an important part of Making Every Day Count. 10. I will stretch my mind with reading, learning, music, art and travel. It will be interesting to keep track of this Making Every Day Count program. In addition to growth, joy and abundance – I want to enjoy KNOWING that I am not spinning my wheels, having unproductive days or wasting time. 1. How would I view/value this in retrospect 20 years from now? 40 years from now? Figure I’ll sleep better and develop a greater hunger to Make Every Day Count as I go along. Probably become a heck of a lot more productive, happy, healthy and fulfilled. I suspect if a person does this every day – they will get better at it. Join me if you want to. Previous PostIt’s Time for the “Te-Vick” Offense in Kansas City: The Chiefs Gameplan for 2013.Next PostWho to call with an electrical problem? In Overland Park (and JoCo) it’s an easy decision 24/7.